Human Kinetics students at UBC's Okanagan campus are taking the classroom to the community and working with health and fitness professionals who are on the cutting edge of novel exercise training programs. A new Exercise Prescription course gives third-year students a foundation in exercise prescription and design while preparing them to think outside the box when pursuing careers as personal trainers or certified exercise physiologists, says Human Kinetics professor Gareth Jones, who designed the course. 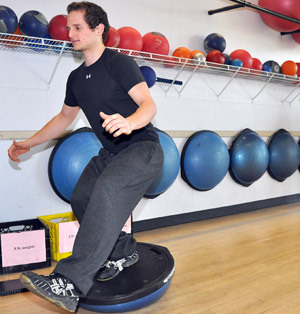 Human Kinetics student Stefan Bigsby practices a training exercise on the BOSU ball at iQuest Healthcare and Fitness Centre. After the course, students have the option of obtaining the first level required for Certified Professional Trainer certification through the Canadian Society for Exercise Physiology, which is recognized as the highest level of professional certification in Canada for exercise prescription with healthy adults. "Compared to 20 years ago, people today are doing much less physical activity," says Jones. "Technology has benefited society in many ways, but at the cost of people's well-being -- they no longer get enough daily physical activity and exercise to maintain their health. "This is why it is increasingly important that we have knowledgeable personalized trainers who have the skills and ability to create and implement innovative and specialized fitness programs that target not only healthy adults and athletes but facilitate injury rehabilitation and management of chronic disease. Working with staff at facilities such as iQuest Healthcare and Fitness Centre, Twist Conditioning Inc. and CrossFit Kelowna, university students are getting the opportunity to learn how health care and fitness centres are moving away from the traditional gym mentality toward more innovative and customized training exercise interventions. "At these places you have to actually work with a trainer through unique programs designed for the individual, and I think it has been an eye-opening experience for the students," says Jones. "It's one thing to give students the theory of exercise, the evidence behind it, and directions on how they should be prescribing it, but it's going be up to the individual to seek out best practices -- this course provides students with both the theory and practical aspect of making those decisions wisely."